For centuries, the Silvanesti elves remained aloof from the rest of Krynn. Many times they retreated to their sacred forest, taking no part in world events until some outside force invaded their sanctum. Soon after Chaos ascended to power on Ansalon, the Silvanesti took extreme measures - magically shielding themselves from humans, dwarves, dragons, and even other elves. As the years passed, those outside the Silvanesti Shield wondered what was going on behind it. Some even attempted to penetrate the barrier or bring it down. But the shield never yielded. Let your heroes be the first to set foot into lands newly exposed by the mysteriously retracting shield and find out secrets of the Slivanesti Forest heretofore known only to the elves. Life has not been idyllic for those inside the sylvan veil. In fact, your heroes find themselves on a desperate quest to save an elven city from extinction. More than just an adventure, this book also details Silvanesti culture and politics, geography and places of interest, important individuals, and elven magical items and artifacts. 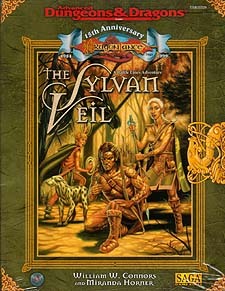 Players can use The Sylvan Veil to flesh out their Silvanesti heroes, while Narrators will find an abundance of ideas for further adventures in the forest and its environs.